Violent exchange between rival gangs captured on girl’s mobile phone. Chelsea’s THIRTY Loan Players Rated. WOW! Top 20 Worst Haircuts In Football Ever. Tottenham To Use Roberto Soldado As Bait In Bid For La Liga Goal Machine. Leicester City’s 1-0 win over Aston Villa on Saturday afternoon ended with a scuffle, which resulted in Matty James and Ciaran Clark getting red cards. 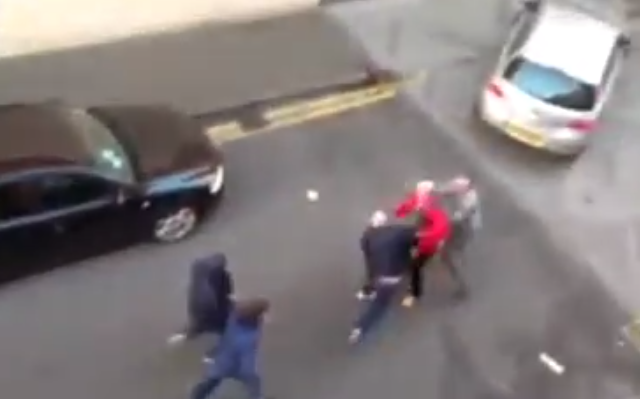 Earlier in the day, at around 3.30pm, another fight was caught on camera in Leicester City Centre. Witnesses claim that it was between Leicester and Villa ‘firms’. Punches were thrown, as was a traffic cone and a bin. WARNING! The below video features acts of violence.